MatCaps™ are materials with their lighting and other attributes baked in. You can create your own MatCaps in various ways, including using the MatCap tool, available in the Tool palette 2.5D tools. 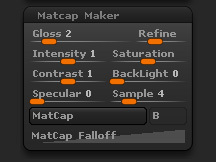 The MatCap Maker sub-palette is primarily for adjusting MatCaps you are making using the MatCap tool. Adjust the glossiness of the MatCap material. Adjust the Intensity of the MatCap material. Adjust the Saturation of the MatCap material. Adjust the Contrast of the MatCap material. Adjust the Backlight of the MatCap material. Adjust the Specular of the MatCap material. Set the Samples for the MatCap. Press MatCap to refresh your MatCap markers and transfer MatCap information to your material map. Turn on the B option to transfer information to the second MatCap sphere. The Falloff curve works only when creating or modifying a MatCap using the MatCap tool. It’s best to experiment with this curve to see if it will be useful to you. Changes in the falloff curve may cause large changes in the appearance of the material, so when first experimenting, change the curve just a little bit at a time.